The pilot ADP was launched as a recommendation of the MAPS, to undertake urgent improvements needed for monitoring the MDGs. 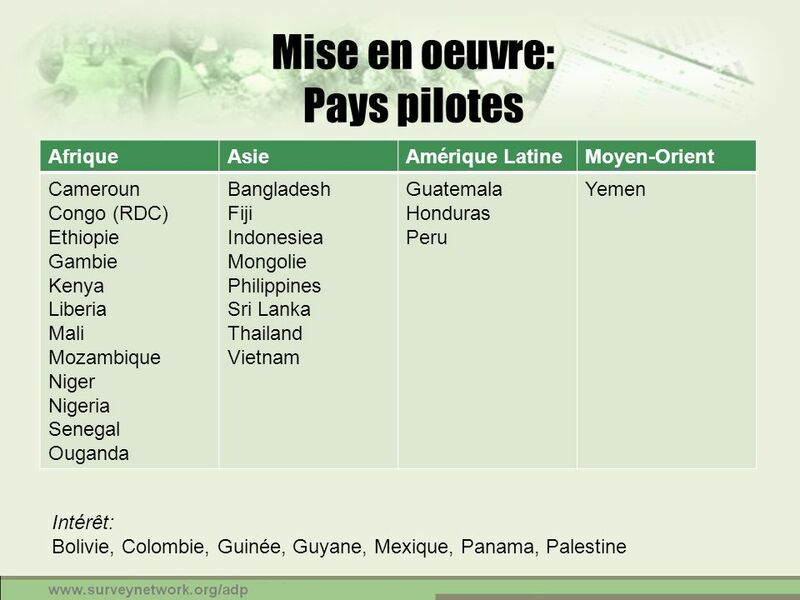 Since 2006, the pilot ADP is implemented as a partnership between PARIS21, the World Bank, and other international partners. 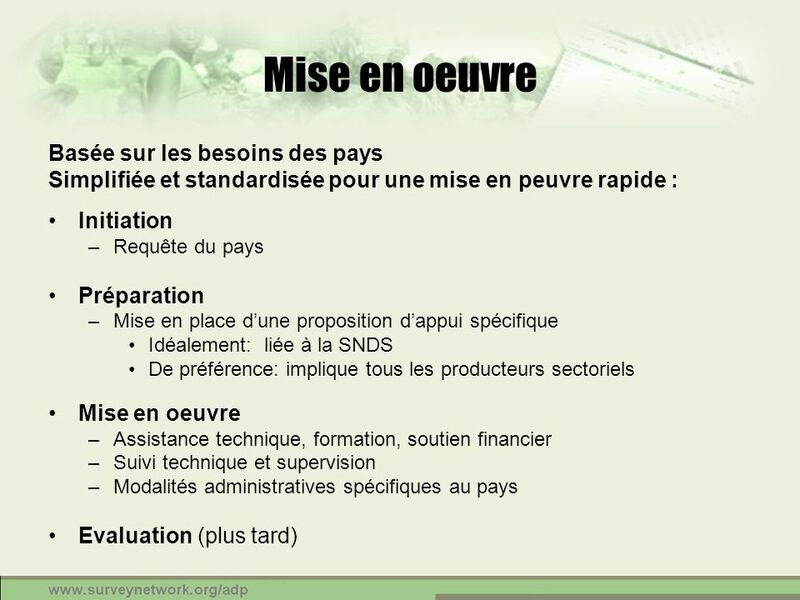 Simplifiée et standardisée pour une mise en peuvre rapide : Initiation Requête du pays Préparation Mise en place d’une proposition d’appui spécifique Idéalement: liée à la SNDS De préférence: implique tous les producteurs sectoriels Mise en oeuvre Assistance technique, formation, soutien financier Suivi technique et supervision Modalités administratives spécifiques au pays Evaluation (plus tard) Initiation. 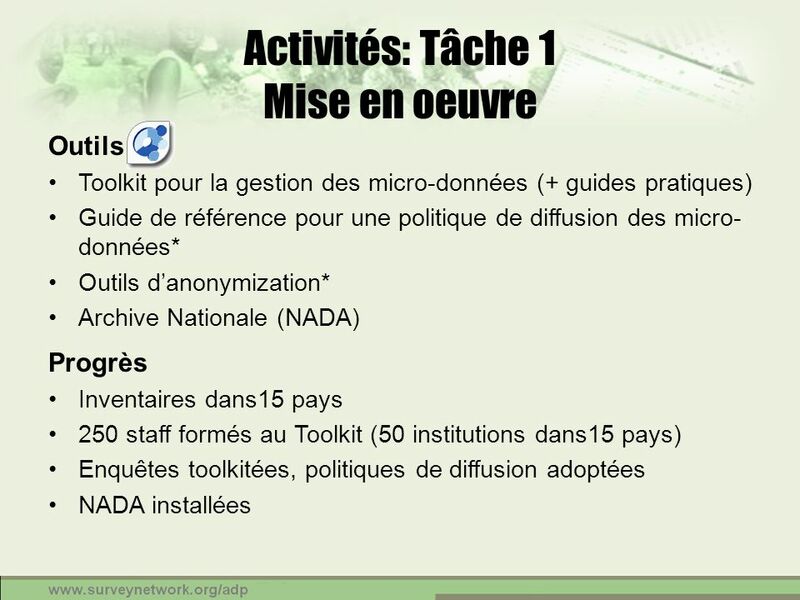 The ADP is initiated in a country by an informal request for support formulated by an interested national agency. 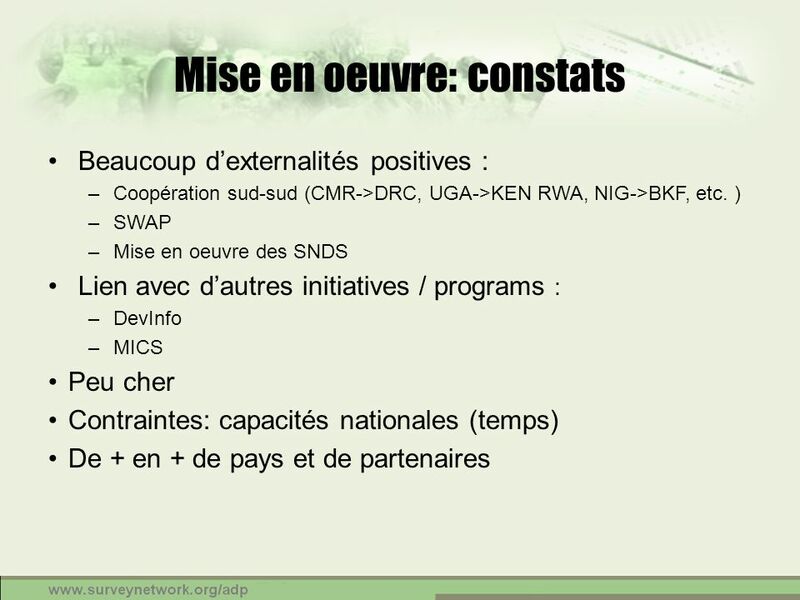 Priority is given to the poorest countries, who express a strong commitment in improving the management and use of their microdata. Preparation. 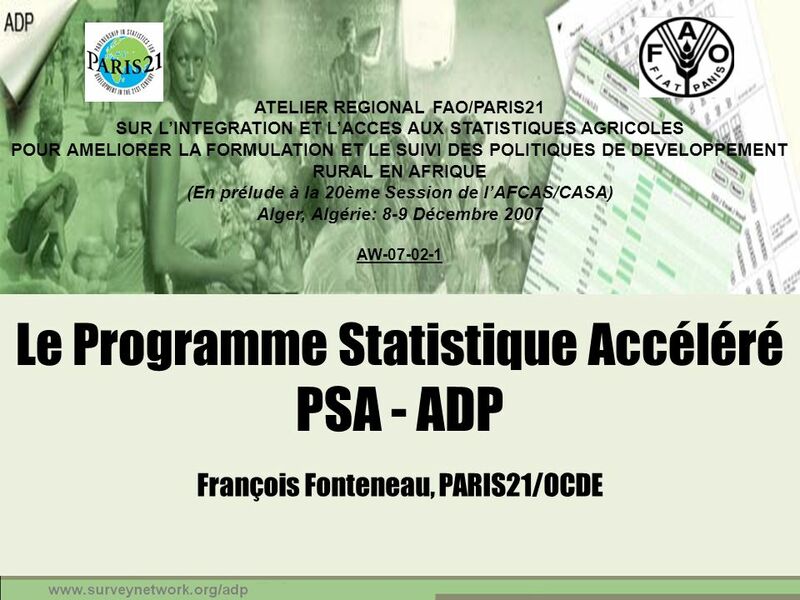 After the PARIS21 Secretariat notifies the agency of its agreement to provide support, a country-specific ADP work program will be developed (tentative budget and calendar). This will typically involved a mission by an ADP staff to the country. 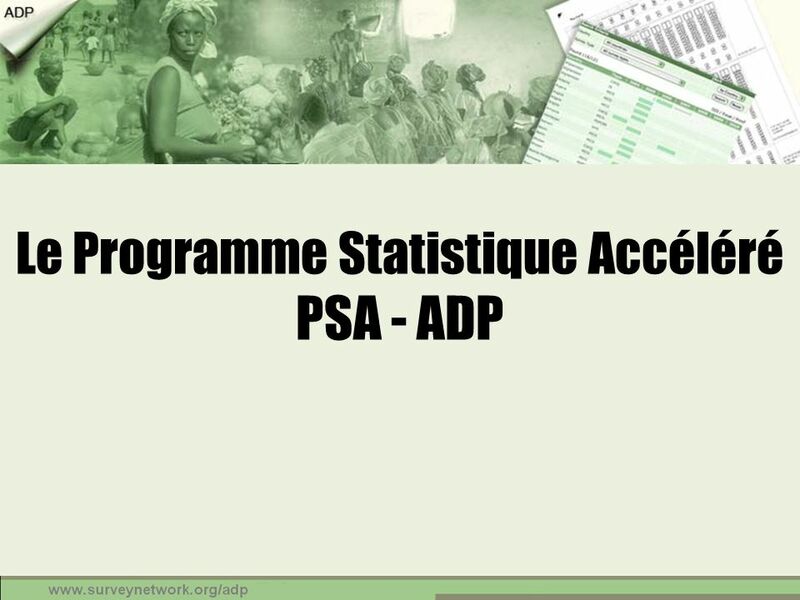 Ideally, the ADP work program will be explicitly linked to the national statistical strategy. Also, the project should preferably involve all key microdata producers in the country, and not be limited to one producer. Implementation. Once a country-specific work program is formulated, the ADP will start providing the technical assistance, training, and financial support required for its implementation. The administrative modalities may vary from country to country. 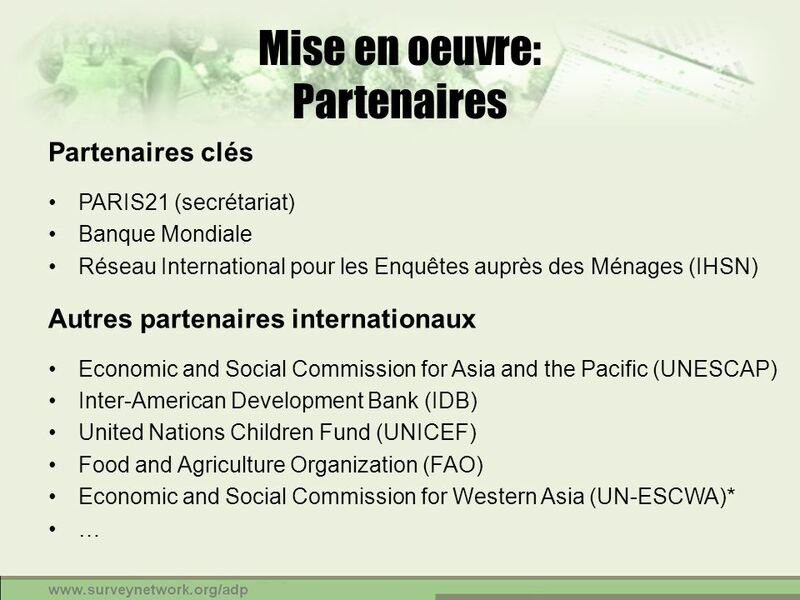 International consultants will usually be recruited directly by the PARIS21 Secretariat. 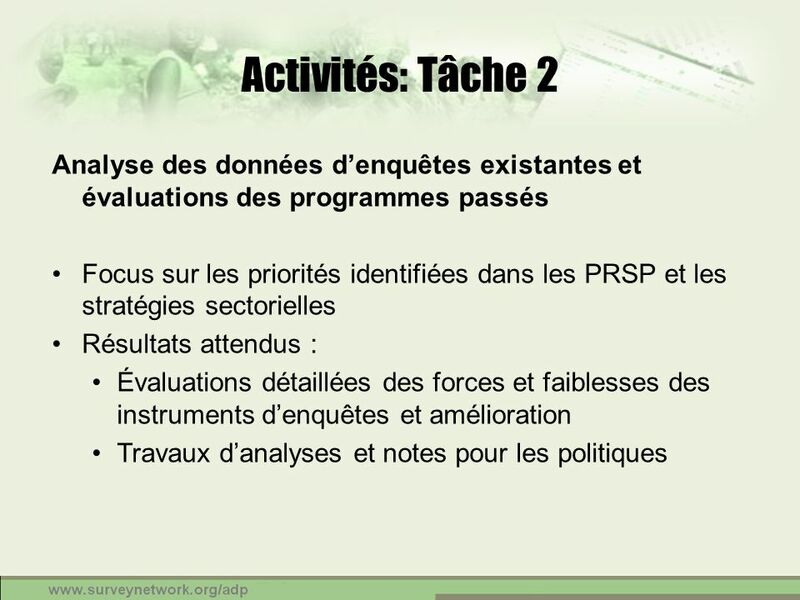 For financing local activities (organization of workshops, procurement of equipment, hiring of local consultants), the preferred option is to establish a service contract between the executing agency and the PARIS21 Secretariat. 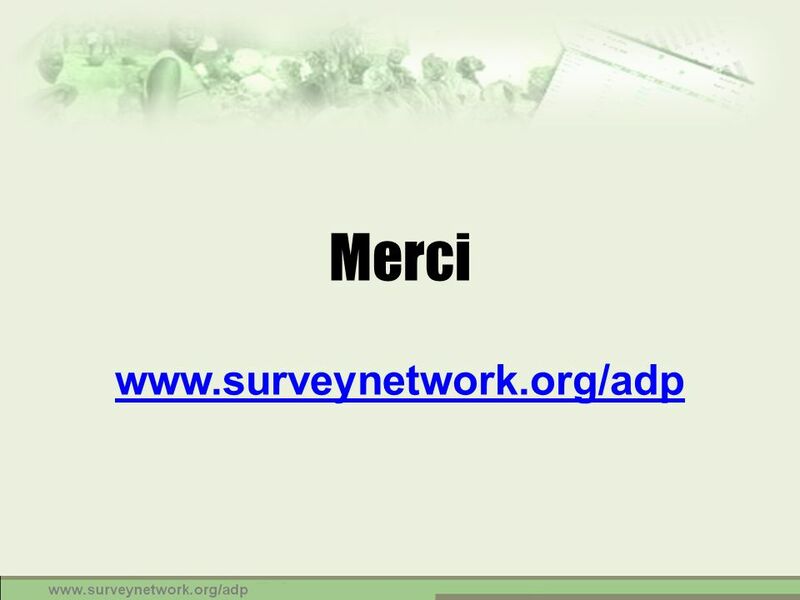 The ADP team will provide regular technical follow-up and supervision. Revisions of the work programs are possible and require very little formalities. 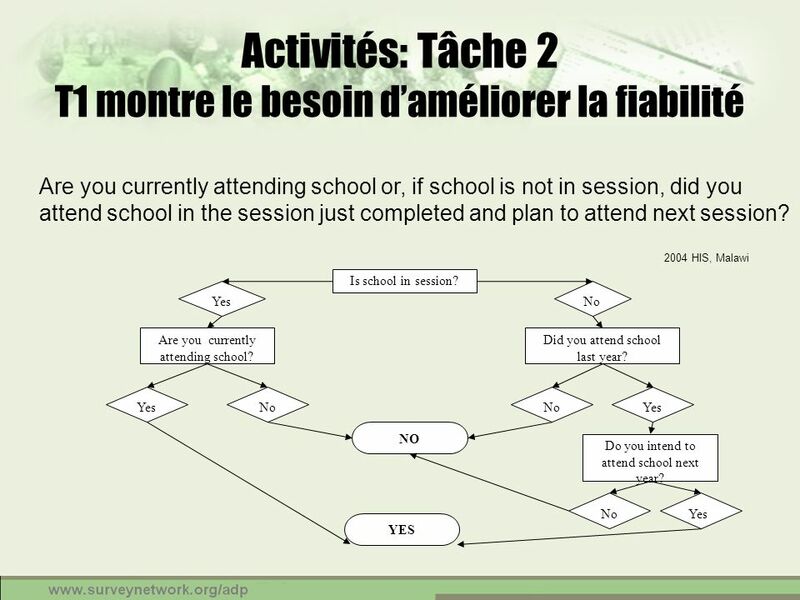 Are you currently attending school or, if school is not in session, did you attend school in the session just completed and plan to attend next session? 2004 HIS, Malawi Is school in session? Are you currently attending school? Did you attend school last year? Do you intend to attend school next year? Yes No YES NO The EPDC selected 15 education indicators to calculate from the datasets - over-age children (%), under-age children (%), on-time children (%), over-age first grade students (%), gross intake rate, net intake rate, education attainment, literacy rate, gross attendance rate, net attendance rate, completion rate, dropout rate, promotion rate, repetition rate, and transition rate. This is a standard set of common education indicators that give information about how many children start school and remain in school, and how they flow through the education system. The indicators are extracted with STATA. The indicators are extracted from 24 of the 30 datasets at the time of writing. For the remaining six datasets there was information missing regarding the sample or coding, so the indicators could not be extracted. 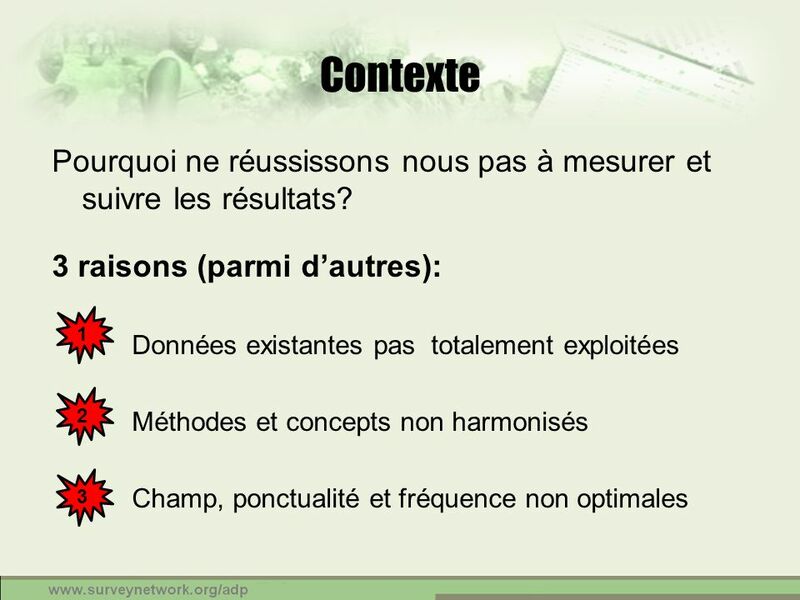 For each indicator the EPDC calculated an average standard error (SE) to examine the reliability of data extracted at the national and subnational levels. For this analysis, any SE higher than 2.52 is considered statistically unreliable to use (a standard error of 2.52 provides a confidence interval of 95%). Table 10 and Figure 1 show the standard errors at the national level. Table 10 shows the actual numbers, and the standard errors that are higher than the acceptable level are marked in bold font. Figure 1 shows dots to give a general impression of which indicators have high, and which have low standard errors. In the figure, each dot represents the standard error for one country (as not all indicators can be extracted from all countries, there are usually fewer than 24 dots for each indicator). The highest range of standard errors is for the gross intake rate and the primary completion rates. National level indicators Percentage of over-age, under-age, on time students and over-age first grade students can be calculated for 16 out of 24 datasets. The standard errors for these indicators are generally within in the acceptable range. However, for the over-age first grade students (with smaller sample sizes because the selection is limited to one grade) standard errors were larger: only six of these 15 datasets had SE smaller than 2.52. Gross intake rates can be calculated for 15 of the 24 country datasets – the remaining nine data sets did not have sufficient information on single year grade levels to calculate the indicators. The average standard error for the extracted gross intake rates was higher than The reason for such high standard errors may have to do with the fact that standard errors are calculated in such a way that leads them to almost always be high for indicator values greater than 100%. As Table 10 shows, gross intake rates have considerably high standard errors for all country dataset. 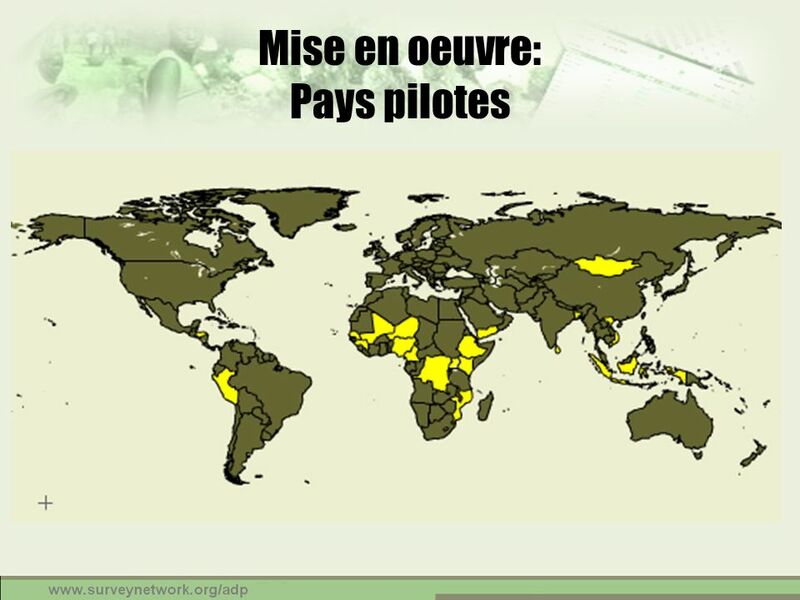 Net intake rates can be calculated for the same 15 out of 24 countries as gross intake rates. Though standard errors for net intake rates are considerably lower than those for gross intake rates, many (10 out of 15 exceed 2.52). Gross attendance rates can be calculated for 19 out of 24 datasets. In five countries, attendance rates cannot be calculated because surveys do not include specific information about school levels attended. Of the 19 countries for which GAR was calculated, only seven provided indicators with standard errors below The reason for this was probably related to the same cause as the high standard errors for GIR. Educational attainment and literacy rates are the most commonly extracted indicators. Educational attainment (by level) was extracted for 23 of the 24 datasets and the literacy rate for 20 out of the 24. The standard errors for both indicators and all countries are low and within the acceptable range. Efficiency indicators (completion, dropout, promotion, repetition, and transition) can be calculated for only three of 24 datasets. While 19 surveys asked questions related to school flows, only three included the full set of questions needed to calculate the efficiency indicators (for more on this, see Education Flows on page 15). The repetition rate for Cameroon is available because the survey specifically asks “Is [name] attending the same grade this year as they attended last year]. SE’s exceeded 2.52 for seven of the sixteen efficiency indicators . Across 24 datasets, Bangladesh HIES 2000, Madagascar 2001 and Sierra Leone HIS 2003 had over 50% of 15 education indicators with a high average standard error (SE>2.52). 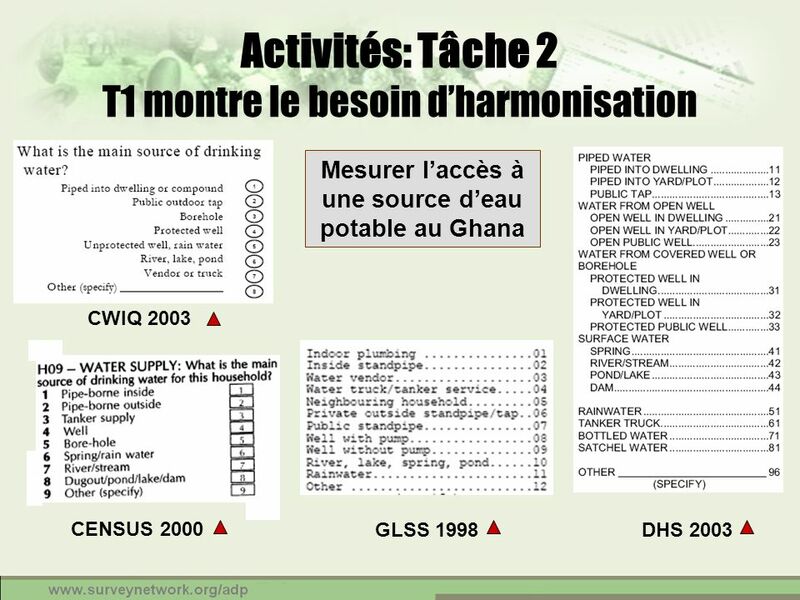 Subnational level indicators The 15 indicators were also extracted at the sub-national level. 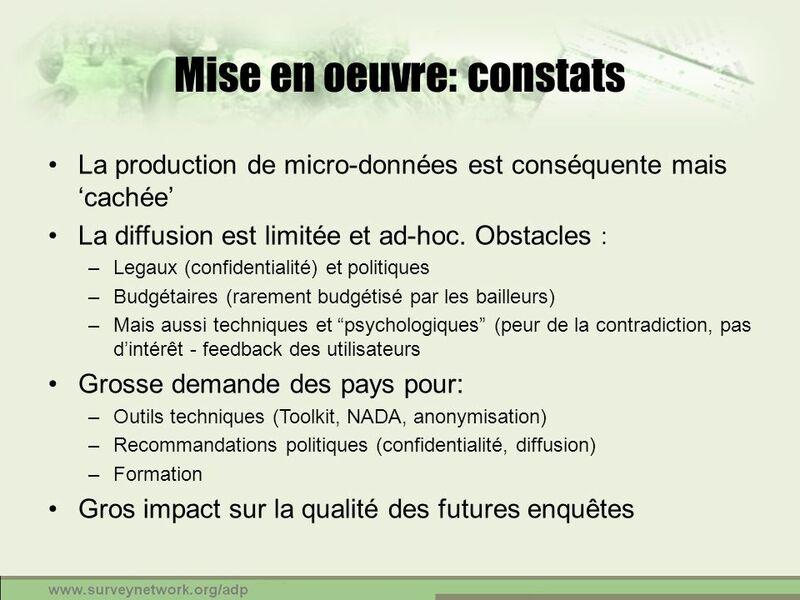 Because there are smaller sample sizes in the sub-national regions, it is possible that the standard errors are larger than at the national level, and that some regions have to be dropped. Table 11 shows the standard errors for the same indicators. As expected at the subnational level, even more of 15 education indicators has high standard errors, except for the education attainment data. All 24 datasets with education attainment data had an average SE smaller than Out of 20 datasets that had sufficient information to extract literacy rates, only eight provided reliable data on average. Uganda NHS 2002, Pakistan HIS 2001, and Malawi HIS 2001 has more than 50% of their data reliable to use at the regional level whereas Tanzania HBS 2000 and Cameroon ECAM 2001 provide at least three indicators that are reliable to use on average. 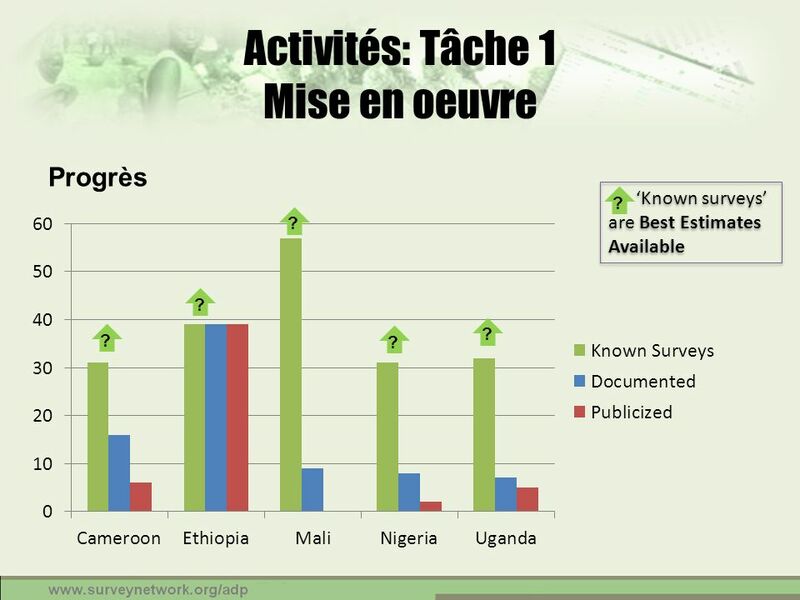 The rest 10 datasets had only one or two indicators with small SE for the use of the data at the regional level. 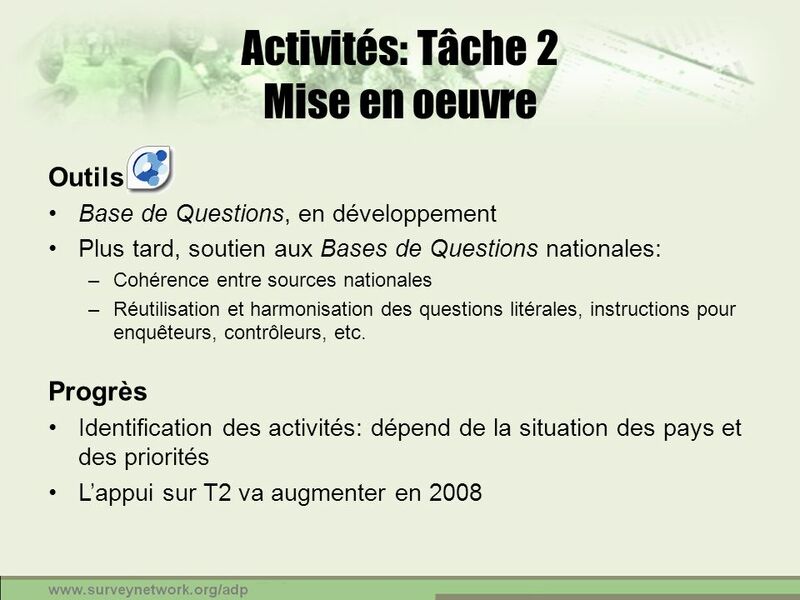 SE ranges with minimum and maximum values of 15 education indicators for 24 IHSN country datasets can be found in Table 15 and Table 16 in Appendix B.
Télécharger ppt "Le Programme Statistique Accéléré PSA - ADP"
Where ICT meets Social & Economic Development Données gouvernementales ouvertes en soutien à l’agriculture Stéphane Boyera PDG SBC4D.